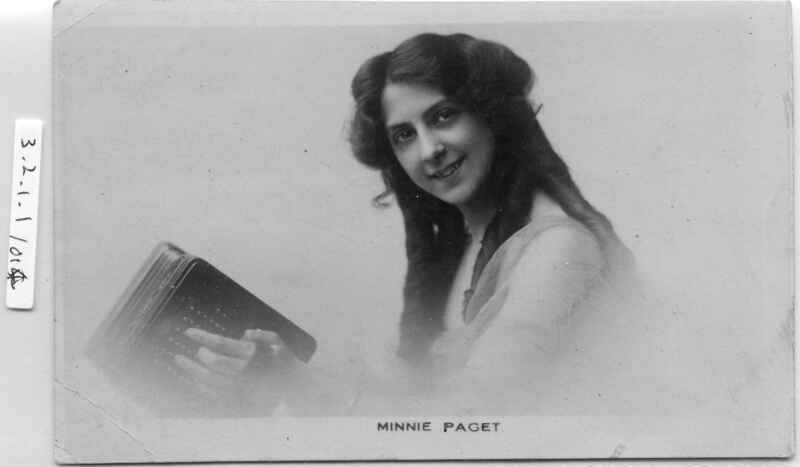 Full Description: A British Photo-card labelled “Minnie Paget”. Close-up of her, hair in ringlets, playing her trademark square 6-column Maccann-style concertina (see further Paget Postcards at NC.3.2.1-013 ) Postcard header to rear, labelled “real Velvograph”, and cartouche with “Frank Dolan, The Photo Works, Waterloo, Liverpool – specialist in reproductions”. Rear is ALS Minnie Paget.